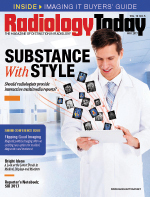 Should radiologists provide interactive multimedia reports? Radiology reports have changed little since Wilhelm Conrad Röentgen's discovery of the X-ray in 1895 launched the medical specialty. Despite advances in imaging technology over the last 100-plus years, radiology reports are still largely words only. "We have had some advancements in how we issue the report—transcriptionists have been replaced by speech recognition software, but the format of our reports remains plain text," says Christopher "Cree" M. Gaskin, MD, a professor of radiology and medical imaging and orthopaedic surgery, vice chair of informatics at the University of Virginia (UVA) Health System in Charlottesville, and an associate chief medical information officer. Gaskin and some of his colleagues believe radiologists are missing a tremendous opportunity to showcase their value by not heading where other specialties such as gastroenterology and ophthalmology have—to multimedia-enhanced reporting. Interactive multimedia reports include text and key images, quantitative information in the form of tables and graphs, interactive features including hyperlinks to key regions of interest on specific images, and bookmarks that take users directly to relevant prior images. "Every time I pull up a case, if it doesn't have hyperlinks, I'm disappointed," says Les R. Folio, DO, MPH, MSc, MAS, lead CT radiologist at the National Institutes of Health (NIH) Clinical Center in Bethesda, Maryland. Folio believes that multimedia reports are as revolutionary and exciting as PACS were in the early 1990s, when he was among the first to implement them into the Air Force. Radiologists were clearly leaders when they created PACS more than 20 years ago. "Radiology was advanced more than other medical specialties and drew other specialties into digital imaging by developing PACS," Gaskin says. Now, for example, ophthalmologists are likely to include images showing where their patient's optic lesion is in their reports. But radiology has fallen behind for a number of reasons, Gaskin says. One is culture and another is, ironically, technology. In recent years, radiologists have adopted speech recognition software and are moving toward more structured reporting—using a library of reporting templates—so that their reports are clear and consistent and easily understood by humans and machines alike. However, many radiologists find it difficult to change their longstanding practice of providing text-only reports for the images they interpret. "It would take cultural change for radiologists as a group to routinely enhance their reports with images, graphs, tables, and hyperlinks to bookmarked findings," Gaskin says. "And cultural change takes years." Younger radiologists who grew up with smartphones, computers, and the internet may be more comfortable enhancing their reports with hyperlinks and bookmarks. "I would say our residents take to it more quickly, but they don't have 25 years of habits built up that they need to overcome," Gaskin says. Raym Geis, MD, FACR, a radiologist in Fort Collins, Colorado, and vice chair of the ACR's IT Informatics Commission, agrees that the radiology community is fighting tradition on this development. "The first 80, 90 years of radiology practice, everyone learned how to do text reports," he says. "So you have the history of the way we've always done it—dictating a prose report—getting in the way." Structured reporting is facing similar obstacles, Geis says. "Getting radiologists to do structured reporting is coming, but even that is coming slowly." Technology can be more of a roadblock than the solution. The issue isn't the ability to put images or hyperlinks to bookmarks into PDFs, Gaskin says; the technology to do those things exists outside radiology. The issue is the technology to make a multimedia version of a radiology report "and have that pass downstream to where the version needs to go, which typically would be the EHR," he says. "There are format issues between vendors and products that just have been slow to adopt." Gaskin and UVA's IT team worked with Carestream Health and Epic to integrate Carestream's PACS with Epic's EHR. It takes buy-in from all PACS and EHR vendors, and that isn't happening, Geis says. "PACS vendors have no easy way for me to pick an image from a case I'm reading and say, 'Send this to a report.' And there's no way from the EHR vendors' side to receive it, if there were." Theoretically, it should be possible, Geis says. "But just because it's easy theoretically doesn't mean you have a way to get this to work." Folio agrees that too many silos—PACS, RIS, health information systems, and EHRs—have emerged to make communication among them possible, with compatibility being the main issue. While radiologists may be slow to change, some research shows that attaching images or links to radiology reports would be extremely helpful to users and could be very efficient for everyone. Oncologists in particular would favor the ability to link directly to the images in radiology reports, Folio says. In a pilot study presented at RSNA 2015, Folio and colleagues at the NIH found that multimedia reports with data tables and hyperlinks to key image measurements of target lesions on 20 consecutive cancer patients facilitated oncologists' analysis of tumor response to treatment and resulted in significant time savings. It did not take the two radiologists in the study significantly more time to add data tables and hyperlinks when preparing their reports, and the oncologists who used them found that having the data improved their decision making, the preliminary study concluded. Still, Folio says, larger, controlled studies are needed. Years ago, Folio and colleagues surveyed more than 200 oncologists (with 109 responses) and 35 radiologists (with 28 responses) at NIH to establish the utility of multimedia reports. He determined that oncology histories were not adequate—nor were their prior text-only radiology reports—and multimedia reports with improved quantification techniques would be more informative for oncologists. Additionally, most oncologists (93%) would prefer to have tumor measurements managed at the source of input: the radiologist (or assistant) measurements in PACS. This important information helped NIH begin digitizing cancer informatics, which had traditionally been handwritten, says Folio, who published the findings in the Journal of Digital Imaging in January 2017. "This would have not been possible without the bookmark lists in multimedia reports," he says. Radiologists' first reaction to multimedia reports is often that they would be time-consuming to produce, and radiologists have so little time as it is. However, Gaskin says, multimedia reports could potentially save everyone significant time. "Say you just stick with one piece of the multimedia report, which is inserting a key image," he says. "The radiologists might spend less time describing it, and the clinicians who ordered the exams could spend less time digesting what the radiologists wrote. The clinicians could see for themselves and may have a better understanding of the area of interest because they saw it on an embedded key image. It also might save them more time by not needing to access the full study. They've already seen the money shot." Gaskin also argues that multimedia reports could be more accurate and reduce the likelihood of human error. For example, a radiologist reading a study of a kidney lesion measures the lesion in the viewer. Then, he tells the speech recognition software, which connects to the viewer, to insert his last measurement, which happens to be 3 cm by 5 cm. The software automatically imports the measurement and maintains context with the measurement location. "I didn't have to dictate those numbers, because [the software] knows the actual measurement, as well as the series number and the image number, and it made a hyperlink to [the location]," Gaskin says. "Thus, there's no chance for a speech recognition error on these numbers. The text says 'lesion in the left kidney (3 cm X 5 cm) (series 2, image 30),' and I've put detailed information in there with no opportunity for error." Multimedia reports can also be used to help oncologists calculate therapeutic response to treatment, Folio says. He and colleagues at the NIH Clinical Center found that most metastatic lesions were randomly selected for measurement. As a result, the evaluation of tumor burden in patients in clinical trails often differed between radiologists and oncologists. Folio and his colleagues conducted a study in which they compared text-only reports with multimedia-enhanced radiology reports that included hyperlinked measurements, which were done with the help of a radiologist assistant. The goal was to see whether the hyperlinked reports would improve tumor response assessments, and they found that they did. The findings were published in the American Journal of Roentgenology in February 2017. As this study and others have shown, Folio says, multimedia reports clearly add value to cancer trials. Even if it were possible for radiologists to easily enhance their reports, some issues still would have to be worked out, Geis says. "First," he says, "figuring out what images to attach to a report is not a trivial thing." The goal of a radiology report is to help whoever is going to use it to take action on the patient. "You want to help that clinician do his job, but different clinicians may have different needs from the report," Geis says. For example, if the radiologist is talking about a tumor, the oncologist may want to see the margin or the size or some characteristic of it. Meanwhile, the surgeon may want to know the relationship of the tumor to other pieces of the patient's anatomy in order to plan surgery. And someone else might need to know how it's going to affect physical therapy. "So, if you try to put the one image in it that's going to help the oncologist, and the data that's going to help the surgeon, and the information that is going to help the physical therapist, it gets more complicated all of a sudden," Geis says. And what about patients who are being given more access to their medical records? The images and content that would be valuable for the patient is also debatable, Geis says. Gaskin says radiologists could help patients by including links to information that their patients would find helpful. For example, he says, a patient with a lung mass who has a chest CT may find a link to RadiologyInfo.org, sponsored by the ACR and RSNA, included with the image. "As a radiologist, you could put hyperlinks to things like this in your report, if you think your patients would find them useful," Gaskin says. Gaskin also believes that radiologists who are leaders in their field and enhance their reports with hyperlinks to bookmarks, graphs, and other data could find they get more referrals/business as a result. Everyone today rates what they buy—whether it is a product or a service—on the internet for all to see. Gaskin sees a potential future where radiologists are rated and those who provide enhanced multimedia reports get better reviews than those who don't. A patient who tears his meniscus may not fully understand what he's looking at in the radiology report, but he's still interested in seeing it, Gaskin says. "If he can click on a link that takes him straight to the tear, it doesn't change the outcome, but it could change his satisfaction with his doctors," Gaskin says. The patient may give his doctors higher marks because of the enhanced reports. "There's no question that hyperlinks and bookmarks and graphs make radiology reports sexier," Geis says. "It's one of the things that companies that [facilitate these capabilities] say: 'Your patients will like the reports so much better.'" If radiologists are including images in their reports to the general public and are doing so for the public relations of it, that's a different conversation, Geis says. "But there's a case to be made for that." Clinicians also might prefer to collaborate with radiologists who make it easier for them to understand what they're talking about by linking to key images or providing graphs and charts that describe the changes to the patient's tumor over time more visually, Gaskin says. At this time, however, radiologists are not seeing demand for multimedia reports, Geis says. He does note, though, that the emphasis on value-based services could increase interest in multimedia reports. "It will be interesting to see; as the payment system changes to paying for value, it could be a potential driver for more multimedia reports," Geis says. "The theory is that images plus reports would provide more value and more efficient and cost-effective patient care. If studies show that, it could happen." Geis also sees a need for standardization to generate multimedia reports. "That interactive capability should be an important requirement of any buyer's request for proposal for PACS, workstations, reporting software, and EHR," he says. Realistically, Gaskin figures it will take years before most radiologists think about building their reports differently with links and bookmarks and longer still until most clinicians expect them to do so. But once radiologists see how easy it is to create multimedia reports and more clinicians see how valuable they are, it will happen, he says. The English idiom that a picture is worth a thousand words most definitely applies in this case, he says. 1. Folio LR, Nelson CJ, Benjamin M, Ran A, Engelhard G, Bluemke DA. Quantitative radiology reporting in oncology: survey of oncologists and radiologists. AJR Am J Roentgenol. 2015;205(3):W233-W243. 3. Machado LB, Apolo AB, Steinberg SM, Folio LR. Radiology reports with hyperlinks improve target lesion selection and measurement concordance in cancer trials. AJR Am J Roentgenol. 2017;208(2):W31-W37.